Errol: Hmmm, how long has Rob been going without talking about chips? Too long, if you ask me. 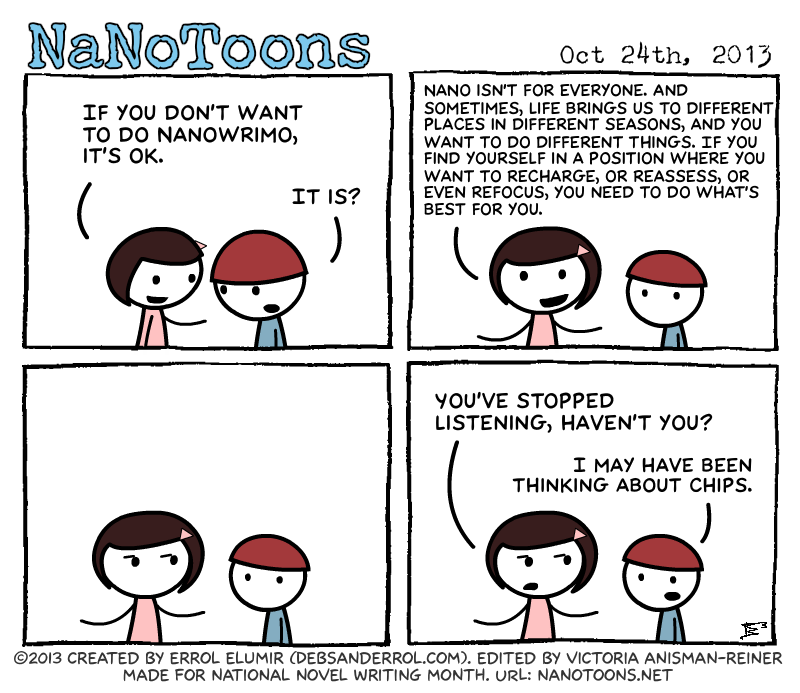 Btw, I got a nanomail asking me when NaNoToons was starting up again. Sadly, it’s not on the main site anymore, but I think people want to know about them. I’ve been linking to it but it seems to not be enough. I could go for some chips too. In other news, it was really frosty today. Like, almost-snow kind of frosty. Boo! I was looking for the link on the main page. That’s how I found these in the first place, last year. Other people should have the chance to discover the NaNoToons too. Me too. I wish these were still on there. So if Victoria’s not going to be ML this year, does this mean she’s back wherever she was last year? Hi Lacee! Nope, she’s just taking a break from doing ML. 😀 She will be at home with the rest of the crew.